Despite Dr. Tina Lamb’s busy schedule as a member of Trident’s faculty, she always has time to give back to those in need. Whether it’s in the classroom or her local community, she leads by example to help make the world a better place. Dr. Lamb, a military veteran who joined Trident in 2009 is a full-time professor of Human Resource Management. She has previous experience as an Associate Dean and Campus Dean for two universities and 14 years of experience as a business consultant for HR management training. Community is important to me, and I love playing a small part in improving the lives of our local veterans, youth, and senior citizensDr. Lamb. In the last year, Dr. Lamb has been with the Wisconsin Rapids Lodge #693, where she was able to impact the lives of more than 1,000 local veterans, scouts, and senior citizens. All of Dr. Lamb’s efforts have led to a total of $6,100 in funding for a variety of great events and causes. After working with a local baseball team, Dr. Lamb developed “Military Mondays” where all active duty military and veterans attend Monday night home games for the upcoming season. They were able to receive a free ticket, hat, hot dog, and a fountain drink. Last year they had 237 veterans attend four of the Monday night games. 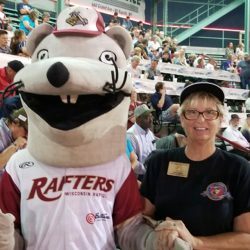 During the 4th of July baseball game, in collaboration with the Wisconsin Rapids Rafters, the players’ shirts were actioned off and their Lodge was given the proceeds of $2,600. These funds were then disbursed and presented as checks to the Boys and Girls Scouts. Dr. Lamb didn’t stop there, she then applied and received another grant. She utilized those funds to purchase hundreds of personal hygiene products and clothing such as socks, mittens, slippers, and winter hats. These items were given to the Wisconsin Veterans Home that has over 600 residents. Dr. Lamb’s goal was to provide items to those residents who had no family in the area to care for them. She doesn’t plan to slow down in 2019. With the help of her local Elks Lodge, she is helping to organize a fundraiser on Super Bowl Sunday and an event on St. Patrick’s Day. The funds raised during the St. Patrick’s Day event will allow 100 children from low income and military families to attend a special Children’s Day at one of the Wisconsin Rapids’ Rafters Military Monday games.